Hi, I’m Christian from Brazil. I lived in Wales for many years, so I can speak English. 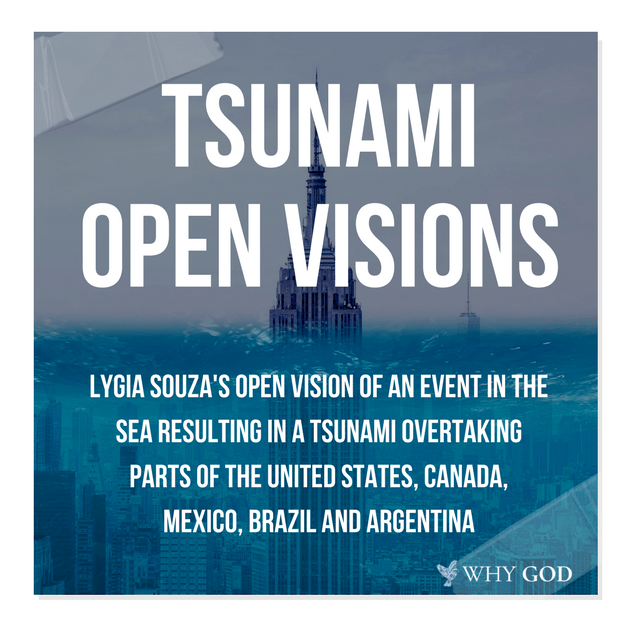 I was having a look at your site and decided to tell you that I also had a kind of vision about a tsunami. One morning, this year I woke up too early and had a cup of coffee, after that I decided to sleep a little longer. At the very moment I closed my eyes again I saw the map of the Americas from a very high point of view. I could see the three Americas from up in the sky. While I was looking, I saw the sea coming in and invading the three Americas ( the Atlantic Coast)and progressively going inland. I remember feeling a surge of great interest and thinking that now I would see , really see what is going to happen but at this minute the vision ended. Thats is all, but it was very powerful. Thank you, I wanted to tell someone. Thank you for reaching out to me. I would love to publish this on my site. It adds to the validity of what others have seen. When you say “map of the Americas” would that be North America… (Mexico, Canada and the United States)? What do you mean by “three Americas from up in the sky” ? Also what do you mean by “I remember feeling a surge of great interest and thinking that now I would see” ? What did you see right before the vision ended. Hi, sorry if it wasn’t very clear! I saw the Atlantic Coast of North America, Central America and South America. Something had happened in the sea just near the Atlantic Coast of the Americas. The sea raced in , engulfing the islands, Porto Rico, Cuba, and getting in North and South America, racing inland for quite a distance. Yes, it entered in Canada , Mexico and every place , also Brazil and Argentina. I saw the maps of the Americas, like if they were drawn in the globe, I saw them like if I was very high up in the space. It was very clear. I saw the water going inland, in a BIG wave. I said I felt a lot of interest because the vision was so real and I felt that I was given something for me to understand and see a bit of what is to come. But the minute I thought that I would see more, the vision finished. I saw enough, however, a big disaster, water taking the Americas, getting in at a high speed. I would like to add that i don’t have those visions easily, only once when I was a child something like that happened and when I was 21 I was praying and understood that Jesus was in my room , it was very strong and I felt love passing all over me. But never felt or saw anything again till this vision of a tsunami. I’m a mature Christan, a young grandmother, I have a ministry of defending the faith.